Sue Decker has been in the hot seat over the last year, as the No. 2 exec at Yahoo, playing a critical role in its business strategy and vision, as the company has sought to reinvigorate itself and has faced an unsolicited takeover by Microsoft most recently. She is responsible for all of the global business operations of Yahoo, including sales, product marketing, product and distribution across the three major customer groups of audience, advertisers and publishers. 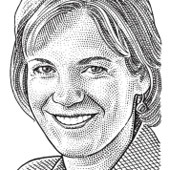 She joined Yahoo in 2000 as its CFO, after a 14-year stint at Donaldson, Lufkin & Jenrette, where she served as the global director of equity research and was also an equity research analyst covering media, publishing and advertising stocks. A graduate of Tufts University, she also attended Harvard Business School. Ms. Decker currently serves on the board of directors for Berkshire Hathaway, Intel Corporation and Costco Wholesale. As readers of mine know, I write a semi-ranty post now and again about the lack of women in high-level tech jobs and on the boards of its major companies. This fall, Glamour magazine and I will be asking about that lack of women. And — fair warning — we have a lot of questions. With all the noisy swirl around Yahoo of late–from its executive turmoil to its flat growth to its dashed partnerships in Asia to its brash CEO–its board has been unusually quiet of late. Comatose, some might say. But with private equity firms, media companies, Web rivals, big shareholders, Wall Street and others all machinating about trying to grab all or some of the Internet giant, it will be interesting to see if its directors will shake themselves out of their typical comfort zone of inactivity to actually do their job. Thus, time for their moment in the BoomTown spotlight! Dressed in a bright red sheath and posed in front of a tangle of tech doodads, Facebook COO Sheryl Sandberg gets her Vogue moment this month. Literally, in a prominent feature in the latest issue of the famous fashion magazine. On Wednesday, though, Sandberg will likely be a little more geeked out at the social networking site’s big F8 developer’s event in San Francisco before an audience of mostly fashion-challenged dudes. According to sources close to the situation, AOL has been busy selecting the board for the company, which is still set to spin itself off by year’s end–even as it slows down a decision on a new search deal with either current partner Google or a more emboldened Microsoft. AOL is using Spencer Stuart in the search for directors, led by well-known headhunter Jim Citrin, sources said, and the company has already settled on several outside candidates. In BoomTown’s bold quest to annoyingly stick a Flip digital video camera in the face of every Yahoo senior exec, this week I worked the last nerve of its CTO and EVP of Products, Aristotle “Ari” Balogh. Actually, the 45-year-old Balogh is a very calm and pleasant man, especially considering the huge responsibility that has been foisted on him by CEO Carol Bartz to rejigger how Yahoo makes its products and services and deploy its technology in a more efficient, centralized and, most of all, innovative manner. To explain all this, Balogh sat down with me twice–he is clearly a glutton for punishment–to talk about where Yahoo stood as it sought to dig itself out of its long slump and reemerge as the potent Internet force it once was. WWYD (What Will Yahoo Do? ): Deal, Sell, Stand Pat or What? Bartz Holds First Exec Offsite, as the Yahoos Turn (and Twist in the Wind)! Coach Carol: Are They Crying? There's No Crying! There's No Crying at Yahoo! Officially just played the worst video game ever. You mark people with an ‘x’ and then wait almost forever to find out who won.